Summary: This under the radar signals service is promising an 85.6% accuracy rate. Today I’m looking at a new signal provider that specializes in both Forex and binary options, MaxiSignals. The developers of this service claim that other providers can’t actually fulfill their promises, but their “results speak louder than 1000 words.” They believe that the best way to provide signals is via robots, and not human traders. There is no real information on who the developers of this signal software are, but based on their server location, it’s my belief that they are located in Russia. In order to get in touch with support, traders can email [email protected]. There are currently utilizing PayPal and web money has their payment processors. In the first statement on the website, we are told that the accuracy of the MaxiSignals service is 92%. Then, in the next sentence we are told that the average accuracy rate is 85.6%. I’m not sure why these numbers are different, nor do I understand why or how this accuracy could fluctuate. Maybe they are saying that the system can trade it 92% for a day, or week or a month, this I’m really not sure of. In reference to how these signals are generated, we are told that the use a unique system based on trading robots that of been created by a team of committed experts. There is no real explanation of these strategies, or the systems themselves, so this could easily just be marketing jargon. The 6 aspects of their service that they want to bring attention to, is that they offer high quality trading signals, a variety of assets, online stats, competent support, affordable prices, and several subscription plans. If you scroll to the bottom of the MaxiSignals website you will see that there are 2 options available. They tell us that we can choose a plan according to our taste. The first plan offers one month of signals for free, and the second plan costs $90 per month. There isn’t really any elaboration on either of these plans, but if I have to assume, I believe that you can likely get one month of free signals if you register and deposit money with their required broker. This is frequently the case with brokers that I’ve reviewed like Pocket Option, Stern Options and Binary Xchange. This is a common practice in the binary options market, and one that is used frequently by vendors that offer “free trials“. There are quite a few statistics provided by the MaxiSignals group. They tell us that they have over 3000 traders subscribe to their signals, 88% of them are winners, and that their services been online for over 1300 days. What I don’t understand in the statistics, is how there could be losers at all. If everyone is trading the same signals, I don’t understand how you could have some people winning had some people losing. I guess if some people are only trading some of the signals this could be possible, but it doesn’t seem realistic. 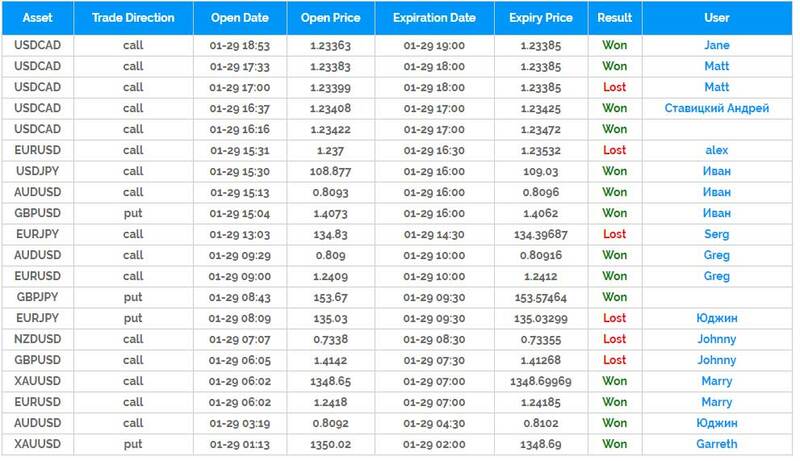 The vendors also provide us with a chart on the front page of the website performance table midway down the website labeled “our customers achievements.” Here we can see trades that have been won or lost throughout the day by different users of this service. In my experience in the binary options market, I’ve found that brokers don’t allow robots are systems to connect to the brokerage account, so I’m skeptical as to how this vendor is providing direct results from their clients trading accounts when brokers don’t provide APIs. Normally, at this point of the review I would provide more in-depth research into the MaxiSignals customer feedback. Yet, despite claiming to have over 3000 members, there is no client feedback on this service anywhere online. Hopefully, this review can act as a hub for traders that of use this service to leave their comments and reviews. Once I get more information from the community, I will consider signing up, so that’s what I’m waiting for now. Please leave your comments and questions below the article now.